Will Hanford Workers Finally Be Safe From Toxic Exposure? by John Stang Crosscut Sept. 20, 2018 11:58 a.m. | Updated: Jan. 18, 2019 10:47 a.m.
Abe Garza of Richland worked around Hanford underground radioactive waste tanks for 34 years. The 67-year-old former instrument technician has lived through many different safety cultures. Respirators are not needed with the protective clothes, workers were told. Then, respirators must be worn. No, respirators are not needed. Back and forth. Back and forth. On Tuesday, the state of Washington, a Hanford union and a Hanford watchdog organization said they have tentatively settled a three-year old lawsuit against the U.S. Department of Energy over workers being made sick from toxic vapors from Hanford’s underground tanks. A key provision of the settlement requires the testing and installation of new technological systems to detect and destroy toxic vapors from the tanks. That’s something Hanford has never had. No one has a comprehensive number of how many tank workers have been exposed to the vapors and have suffered health problems. Tom Carpenter, executive director of Hanford Challenge, said his organization has documented hundreds of such cases — thousands if cases stretching back to the 1950s are added. Washington State Attorney General Bob Ferguson said the Department of Energy had neglected the vapor exposures for years. “Energy, there is no way to sugarcoat this, did not take this seriously,” he said. 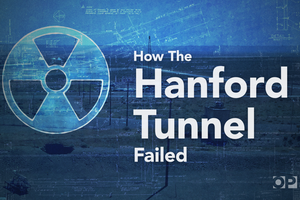 Hanford has 177 underground tanks filled with 53 million gallons of radioactive and chemical wastes all mixed together. The vapors come from exhaust pipes and from the above-ground transfer of wastes from one tank to another. The state, Hanford Challenge, and Steam and United Association of Plumbers and Steamfitters Local No. 598 filed the lawsuit in 2015 against Washington River Protection Solutions, which is the contractor in charge of the tanks, to force Hanford to come up with permanent solutions to workers being exposed to the vapors from tanks. Over the years, Garza — who retired last year — said he has been exposed many times to toxic vapors from the underground tanks. He has dealt with spontaneous nose bleeds, nausea and headaches. He lost his sense of smell. In 2017, Garza suffered a nose bleed that wouldn’t stop while 15 feet from an exhaust pipe on top of a tank. Formerly an avid reader, he now cannot concentrate to read novels. Once a long-distance runner, his lung capacity is a third of what it used to be. He blames Hanford’s tank vapors for his health problems and similar ones suffered by fellow tank farm workers. So do Ferguson and the other plaintiffs in the suit. “This doesn’t end the lawsuit. But it puts it on hold,” Ferguson said. The state, Hanford Challenge and Local 598 are waiting until they are sure DOE is making sufficient progress in dealing with the vapor issues before dropping the lawsuit. For the new system to destroy vapors before they can affect workers, all parties to the lawsuit are looking at a combustion and filtering process already used elsewhere. But such a process has not yet dealt with vapors from literally hundreds of chemicals and radioactive substances, such as those at Hanford’s 177 underground tanks. A best-case scenario would have that system installed at Hanford by March 2020, said Andy Fitz, an assistant attorney general. Another process being considered would gather vapors and use jet-like devices to shoot them high in the air so workers would not breath them in. Permitting and technical issues translate to a best-case scenario to install this process in 2022. The settlement also envisions improved sharing of information among all parties at Hanford and nearly $1 million in federal reimbursement for the state and Hanford Challenge’s legal costs. Neither the original lawsuit or the settlement addressed compensation for individual workers already suffering vapor-related health problems. As for respirators, the settlement says that current rules strictly requiring their use and the use of other protective gear will be kept in place. In 2016, Ken Christensen of KCTS 9 wrote about the environmental challenges at Hanford and produced this video. 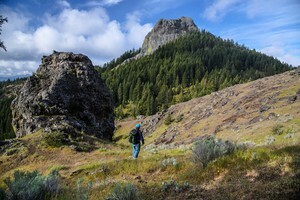 It was part of the EarthFix series Battle Ready: The Secret History of the U.S. Military’s Environmental Legacy in the Pacific Northwest.